Remember when I mentioned that Adam travels a decent amount? And I shared tips and tricks to make short term single parenting easier? And hats off to true single moms and military moms. You are freaking heroes and I don't know how you do it day in and day out. 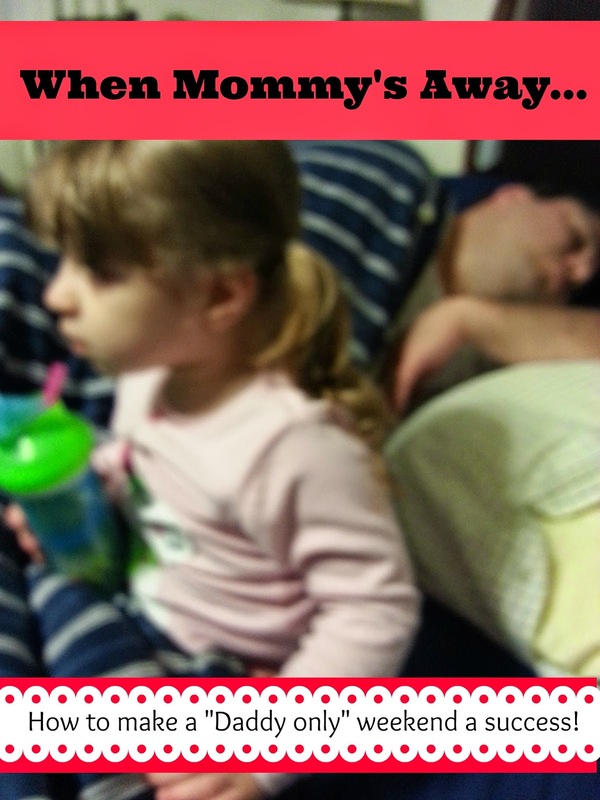 Well, this weekend, Adam had his chance to be the single parent. Before you get all judgy, Adam has been with the girls by himself before. He's been by himself for an overnight. He's been by himself for several days at a time. The difference? His solo parenting days - full days - are few and far between. Shockingly, being a stay at home mom, even one who has become a very part time freelance writer, is not a profession that involves a lot of travel. Go figure. Surprised me too. At any rate, he never gets the opportunity to really get to used to it. I offered to help him out by getting a babysitter for a few hours at home or help him at the pool, his mom offered to help him out, MY mom offered to help him out, but he, politely, turned everyone down. He could do this and didn't need help. I think, I think, that he was kind of looking forward to it, in a weird way. Not in a wow, I finally get 100% quality time way, because no parent of toddlers is that delusional. But in a I finally get the chance to show her how just a little efficiency will stop all her complaining way. He kept talking about things he was going to "try" with them to "make the days easier". I have a nagging suspicion that he was planning on showing me that all my whining about there "not being enough hours in the day" or it being "impossible to keep up" was just that - whining. He was going to test out his own systems and ideas and show me that with just a little bit of planning, he could do it. He was even mentioning some projects he might try to tackle. Did I want him to hang the shelf in the bathroom? Clean up the garage? Now I'll admit, I didn't exactly leave him with a clean slate on Friday. I hadn't gotten nearly enough done on Thursday night, and the girls have been waking up at the crack of dawn lately. He was trying to cram a full day's work into about 3 hours on Friday morning so he'd have the rest of the day for the girls, I was trying to pack, and with all of that going on, I left a few piles of laundry, some dishes in the sink, and some general clutter. I told him honestly that as long as the girls were fed, relatively clean, and alive, I was happy. Turns out that after our phone conversation, the girls ate absolutely none of the pancakes they had him make, and Madison was refusing to get dressed to go sign up for her tennis and swimming lessons. Or rather, she was refusing to wear anything but jeans, which she can't wear to the pool (and it was 85 degrees out). All her other clothes were deemed "too pretty". 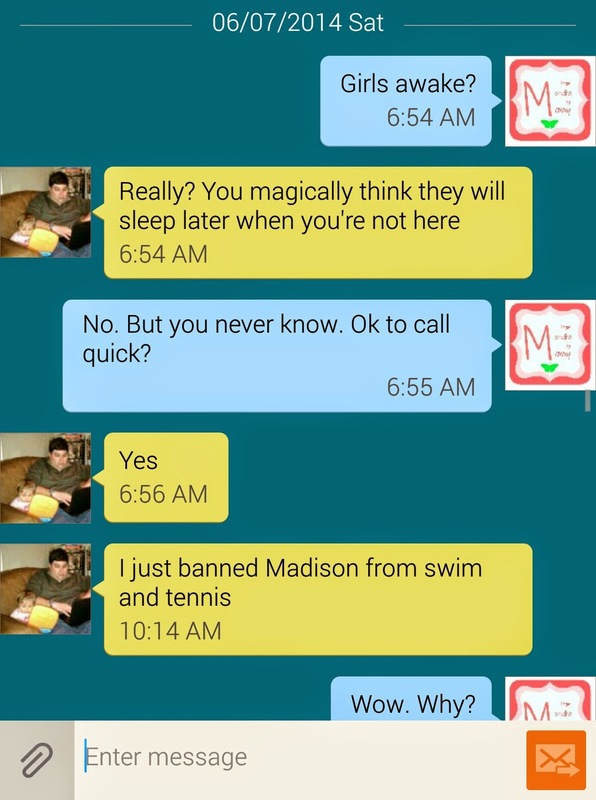 So he banned her from the pool. This is definitely not something that either of us would ever follow through on, and only incited a further tantrum. Which he knew as the words were coming out of his mouth and ended up backtracking. Madison definitely took this match, although she did concede to a sundress and they eventually got in the car. Yup, a wardrobe malfunction. But hey, he brought both pieces of the tankini. Which is a big step up from last year. But the big issue here, one he always brushes off when I'm trying to hurry him off the golf course so I can stop having to split myself in half, is how on earth one manages two small children, both of whom must be watched at all times around water and are not "swimmers" in TWO DIFFERENT POOLS. Because Madison can't go in the big pool alone, and Reagan isn't allowed in there (outside of her swimming lessons) if she's still in swim diapers. Which she is. Have fun with that one! So I ignored that problem while enjoying the complete awesomeness of my conference (another post for another day). I didn't chat with him again until I was on my way home Sunday afternoon. Now before anyone panics, this texting exchange was during a rest stop on what turned out to be a seven hour drive home. Again, another post for another day. But basically the 95 route from the mid-Atlantic to New England is awful on a Sunday afternoon. This is after we'd had a phone discussion about the fact that I wanted to basically hire Sarah every day this week so I could get cracking on all the awesome that I want to implement right now and he was trying to remind me that two days was probably enough, like we agreed upon merely a week ago. We negotiated to three, I called her and got her scheduled, and I was letting him know. 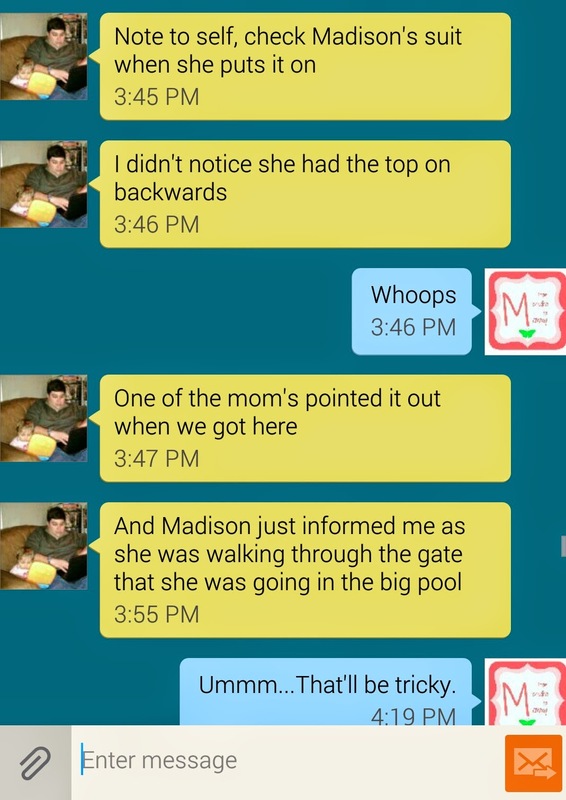 The girls were resting and he was letting me know that everything was under control, despite the fact that after a full day of solo parenting two toddlers at the pool he'd crashed the night before and fell asleep in front of the TV. Anyone want to guess what I came home to? If you answered E, you win! That poor guy was all tuckered out, snoozing in his chair, while the remains of the day lay littered at his feet. Grilled cheese crusts, fruit snack wrappers, Sofia figurines and crayons made a carpet of destruction - the scene of an epic battle. He didn't do any extra projects. He didn't streamline the system. 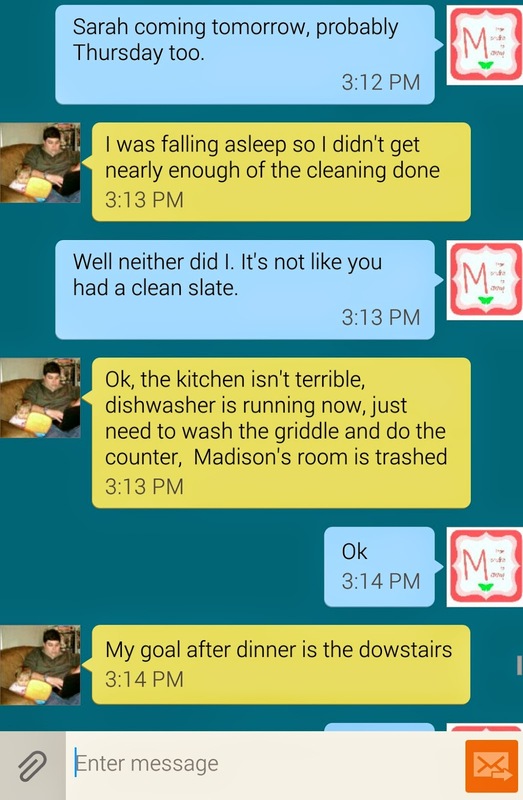 He didn't even leave the house as clean as it started. Two happy girls who were fed, relatively clean, and alive? Mad respect about what I do each and every day?